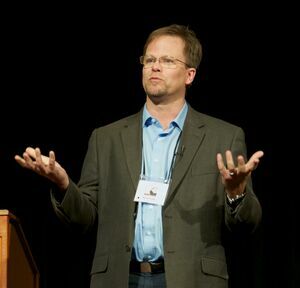 Kevin Folta is a professor and the former chairman of the horticultural sciences department at the University of Florida., Folta has been called a "pro-GMO professor" who "often engages with GMO critics and foes." Folta is listed as one of the experts on GMOanswers.com, a website created as a resource "for information on genetically modified organisms and their use in agriculture and food production." According to Reuters, funding for GMO Answers comes in part from Monsanto, DuPont, Dow AgroSciences (a unit of Dow Chemical), and "other companies." Reuters reports that GMOAnswers is "part of a broad campaign by the biotech industry to try to beat back growing calls for GMO food labeling and for tighter regulation of the biotech seed industry in the United States." Folta describes himself as a "scientist in a scientifically illiterate nation at a time when we need science the most" on his blog, "Illumination." On the blog, Folta pushes back against accusations of corporate influence on his work and discusses non-GMO labels on food products, among other topics. In 2015, The New York Times reported that Monsanto had "passed out an undisclosed amount in special grants to scientists like Kevin Folta," and that Folta "correspond regularly with executives at Monsanto." In an interview with The Times,d Folta "concluded that he could unfairly be seen as a tool of industry, and his university now intends to donate the Monsanto grant money to a food pantry." The article states, "there is no evidence that academic work was compromised, but the emails show how academics have shifted from researchers to actors in lobbying and corporate public relations campaigns." Folta also funds and co-hosts the "Talking Biotech" Podcast, with plant pathology professor Paul Vincelli. Episodes of the podcast are sometimes posted on the Genetic Literacy Project website. The Genetic Literacy Project website is owned by ESG MediaMetrics a public relations company with clients including Monsanto, the Vinyl Institute, and Merisant, a Monsanto spin-off that manufactured artificial sweeteners. Folta maintains that he is independent of corporate influence and pushes back against reporters and activists who he thinks misrepresent him. GM Watch reported that Michael Halpern with the Union of Concerned Scientists has tweeted support for Folta that releasing his emails was harassment. Journalist Paul Thacker and professor Charles Seife published a post on the PLOS blog. Folta responded to the post, calling it "a breach of journalistic ethics," "false and misleading," a "hit job," and a "vicious blindsiding." Eventually, the post was taken down. Seife responded to that, telling Retraction Watch "the criticism of our opinion — much of which is inaccurate and inflammatory — is allowed to remain intact, giving an extremely distorted view of what happened. I’m bemused by the hypocrisy of a number of actors in this drama who claim to be fighting a “chilling effect” on public debate and academic freedom while cheerfully silencing a viewpoint they don’t like." Rachel Parent, an anti-GMO activist, has had public disputes with Folta. The Genetic Literacy Project characterized their disagreements as "attacks" Parent refers to Folta as a "notorious" Monsanto troll. "In today’s world of “fake news” and near-constant attacks on the :traditional media, this Court is especially sensitive to upholding the :legal protections that enable the press to act effectively in its essential :task of policing the government. In summary, Statements 2–16, 18–30, and 32 :are privileged under Florida’s fair report privilege. Statement 1 is not :capable of a defamatory meaning, and Statements 17 and 31 are privileged as :pure opinion." The United States Distrcit Court Final Judgement Summary can be viewed to the right. Folta has also written that Paul Thacker, his ex-wife, and his former podcast co-host Kavin Senapathy are spreading "exaggerated" and "fictitious" stories to "punish him." Folta responded to his SourceWatch profile. Before allowing time to review, he accused the page's author of "a gross distortion of freedom of speech, using words maliciously with intent to harm." Folta maintains he is independent of any corporate interest. A 2015 report in The New York Times, however, states Folta was "part of an inner circle of industry consultants, lobbyists and executives who devised a strategy on how to block state efforts to mandate G.M.O. labeling and, most recently, on how to get Congress to pass legislation that would pre-empt any state from taking such a step." In May 2018, GM Watch, an anti-GMO site, reported that a colleague of Folta alleged he had a lucrative $600/hr consulting arrangement with Bayer. Folta's ex-wife, after "a rather nasty divorce," wrote that "he is trying to hide funds" and alleged that Folta "has done consulting work in 2017 for Bayer at $400/hr"
Kevin Folta served as a panelist at the 2014 and 2015 conferences hosted by Academics Review and the Genetic Literacy Project, which were later found to have been funded entirely by industry. When proposing the budget for the 2014 conference, Jon Entine emailed Folta that he would be paid for participating. Folta emailed back, "I'm glad you put in something here for me, $7500 is a great chunk of change. If it is offered that way I'll earn every penny." Other faculty included Jay Byrne, a former public relations officer at Monsanto who now runs a PR firm that promotes GMOs; Nina Fedoroff, a professor at Penn State, and advisor to a law firm that represents the biotech industry; and Hank Campbell who later became the president of the American Council on Science and Health. After Kavin Senapathy published a 2018 article detailing how Monsanto’s director of millennial engagement, Vance Crowe was planning a "fireside chat with University of Toronto psychology professor Jordan Peterson" regarding “The Danger of Allowing Ideologies to Grow Unopposed,” Folta tweeted his opinions on the matter. Senapathy had quoted Mclean Magazine calling Peterson a “belle of the alt-right." Prompting Folta to tweet, "I feel so bad for Vance. Yes, he underestimated the optics of this. He forgot what evil people will do. Kavin did to him what Brooke Borel did to me. From a hyperbolic, bogus title to misrepresentation of the event, my heart hurts for him. It is very sad." In a follow up Facebook post, Senapathy wrote "I understand that Kevin’s heart truly did/does hurt for Vance. As Kevin explained to me, he has beers with Monsanto’s Director of Millennial Engagement a few times a year." ↑ ICANN, GeneticLiteracyProject.org WHOIS, website registration information, accessed October 19, 2018.